The U.S. Capitol is the most recognizable workplace in the country, and for an estimated 80 to 100 lawmakers, it’s also the place they literally call home while in Washington, D.C.
For three to four nights each week — 30 to 40 weeks a year — these lawmakers don’t leave Capitol Hill at the end of a long day of legislating. Instead, a couch in an office or sometimes even a mattress in a closet serves as their bedrooms. Many wake up and go through the morning routine of dressing and freshening up, even as some of their staff members may be arriving to get an early start on work for the day. The long-term practice has saved scores of penny-pinching lawmakers the cost of renting an apartment or a house while Congress is in session, but it has mostly benefited men who don’t mind padding around their offices in their pajamas or underwear. But it’s a practice the new House Democratic majority wants to end in the #MeToo era, as awareness of the need for protecting women against sexual harassment increases on Capitol Hill. The push is part of changes being considered by a new select committee on the modernization of Congress. The House Administration Committee is also expected to take up this issue later in the year. “It’s one of those bizarre things you talk about with people back home, and they think you’re from another planet,” Congressman Mark Pocan, a Democrat from Wisconsin and a member of the modernization committee, said recently. “Sleeping on your couch is not the best way to go to a hearing and then be at 100 percent,” he said, adding that he hopes the matter can be addressed quickly. During the Republican majority in the U.S. House, many lawmakers openly cited the practice as proof of their frugality. Even House Speaker Paul Ryan, a Republican from Wisconsin, slept in his office at a time when he was the second in line to the presidency. Critics say the practice is essentially allowing lawmakers free living space and utilities at the expense of taxpayers who pay to run the Capitol as a place of work and a showcase of the nation’s legislative history. Former U.S. Congressman Jason Chaffetz of Utah on a cot in his Congressional office in 2009. “There are serious implications for how you do business, how effective you are and the strain on the Capitol workforce that has to clean up — essentially be a housekeeper — for someone who is staying in their office,” said Congresswoman Pramila Jayapal, a Democrat from Washington state. She said the practice may be offensive for staffers — both men and women — who arrive early in the morning for a head start on work. For lawmakers required to maintain a residence in their home district, finding a place to stay while in Washington can be a severe economic hardship. Rent for a one-bedroom apartment in the Capitol Hill area of the city starts at $2,100 a month. Overall, the Washington, D.C., area is among the top 10 most expensive rental markets in the entire nation, according to Kiplinger, a personal finance advice publisher. It can be hard for many members to justify spending so much money when they will only be in town for a portion of the year. Rank-and-file members of Congress receive an annual salary of $174,000, while members in leadership make about $20,000 a year more. U.S. representatives are among the highest paid lawmakers in the world, ranking near the top in salary along with representatives from Australia and Italy. But unlike some other countries, U.S. lawmakers do not receive a living stipend. The new Democratic House majority tried to make the legislative schedule for 2019 friendlier to members of Congress with young families. The House is in session just 130 days this year. The balance allows representatives more time to spend with constituents in their districts but makes an outlay on rent in Washington seem even more excessive. 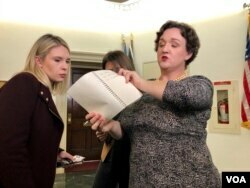 “There's a lot of folks, including sitting members, who have had to change houses and make different arrangements as the cost of the neighborhoods right around the Capitol have become more expensive in recent years,” said freshman Congresswoman Katie Porter, a Democrat from California who is a single mother. Congressional living situations are becoming even more complicated as Congress evolves to being more representative of different economic and family backgrounds, said Jayapal. 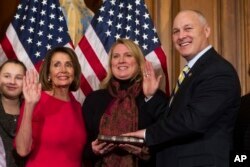 House Speaker Nancy Pelosi of Calif., right, poses during a ceremonial swearing-in with Rep. Pete Stauber, R-Minn., on Capitol Hill in Washington, Thursday, Jan. 3, 2019, during the opening session of the 116th Congress. Washington, Thursday, Jan. 3, 2019. Freshman Congressman Pete Stauber, a Republican from Minnesota, chose a common cost-saving route for many lawmakers by sharing a townhouse with three other legislators. “My room is about 10 feet by 12 feet,” he told VOA. When his children fly into Washington, they share a bunk bed. The Capitol is an often stressful workplace. Quality-of-life and cost-of-living issues should not be on the minds of the legislators and their aides as they tackle the problems of the nation, lawmakers said — although why lawmakers should be exempt from the day-to-day pressures of Americans isn’t clear. “Congress should not be a place where you live in your office because you can’t afford to send your kids to school, and have day care, and have a second home, and you have to deal with all the harassment issues,” Jayapal said. Carolyn Presutti contributed to this report.